Are You Ready for Some Great Racing at Oaklawn Park? As February approaches, it is not too early to start thinking about the first Saturday in May, which we all know is the greatest day of the year — Derby Day. 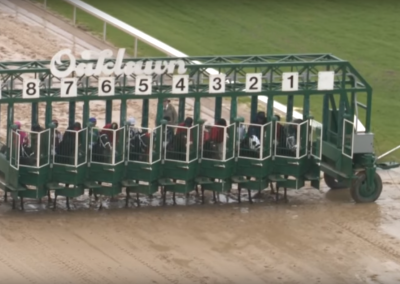 The Kentucky Derby (G1) is still 14 weeks away, but the prep races have begun and Oaklawn Park in Hot Springs, Arkansas is now open for business. The track continues to evolve as a major player on the American horse racing scene. Its 57-day meet runs from Jan. 25 to May 4 (the day the Run for Roses is contested in Louisville, Kentucky) this year. The 2019 Oaklawn meet is different than the Oaklawn meets of yesteryear. This year, the beginning of the meet was pushed back two weeks so “January weather could be avoided,” and the end of the meet is three weeks later. In some ways, Oaklawn is becoming the Saratoga of the winter. Each day offers about $550,000 in purses and there are plenty of stakes races with purses over $100,000. Opening day saw the 12th running of the Smarty Jones, which offered 17 Kentucky Derby points on the famous 10-4-2-1 scale. This year’s race was won by Gray Attempt, who wired the field to win the mile event in 1:36.94. The Smarty Jones (G3) was the first of four prep races for horses trying to make it to Churchill Downs. Next up is the Southwest Stakes (G3) on Monday, Feb. 18 (Presidents Day). That race covers 1 1/16 miles with a $500,000 purse and is another 17-point race (10-4-2-1). The Rebel (G2), the main prep for the Arkansas Derby, saw its purse boosted by $100,000 to $1 million, and will be run at 1 1/16 miles on Saturday, March 16. This race is an 85-pointer (50-20-10-5), with winner virtually guaranteed a slot in the Kentucky Derby starting gate. The marquee event of the Oaklawn meet is the Arkansas Derby (G1). The 1 1/8-mile race offers a $1 million purse as well as 170 Derby points (100-40-20-10) and will be run on Saturday, April 13. We all know that American Pharoah went through Hot Springs on his way to Triple Crown glory and Smarty Jones went the Arkansas route back in 2004, on his way to near-Triple Crown glory. There are several good races to keep an eye on at this year’s meet. In addition to the Derby preps, the venerable Razorback Handicap (G3) for 4-year-olds runs on the Southwest Stakes undercard. The Fantasy (G2), the top race for 3-year-old fillies will be run on Friday, April 12 (Arkansas Derby Eve) and offers a $500,000 purse. Like the Derby and Preakness, the Friday before the big event carries a Ladies’ Day theme. In years past, the Arkansas Derby was the final race of the meet, but, with three extra weeks, there is another race worth keeping an eye on. It is the $250,000 Oaklawn Invitational for 3-year-olds on May 4 (yes, Derby Day). Why is this worth watching? In Louisville, the top 20 point-getters will square off for the ultimate prize in horse racing, but this race may feature a horse that just missed qualifying for the Derby or a horse that started later and, perhaps, slower in 2019. Could the Preakness winner — or, at the very least, a Preakness threat — be in this race? If you think about it, this is where a “new shooter” could come from. While the top horses are in Louisville, a fly-under-the-radar horse might score big in the Oaklawn Invitational. If the winner of this race goes on to win the Preakness or the Belmont, please remember where you got the information from. Oaklawn offers solid money, with overnight allowance races carrying $78,000 purses, so it’s no wonder why Hall-of-Fame trainer Steve Asmussen stables here in the winter. There is still no turf course — and no plans to add one in the near future — but if you want great dirt racing, keep your eyes on Oaklawn. Last year, Rebel Stakes Day drew 37,500 fans and Arkansas Derby Day added 64,500. The 55-day meet (weather cancelled two days) saw an 11-percent increase in handle from 2017. It is clear that things are moving in the right direction at Oaklawn Park.